Figure 5. 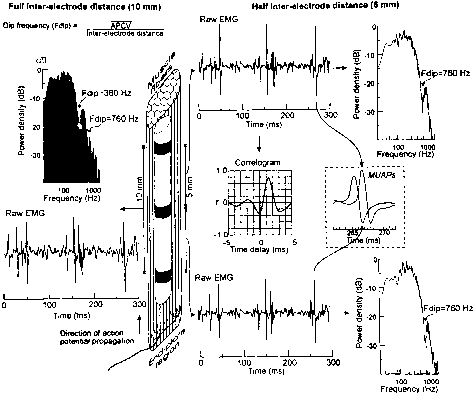 Time and frequency domain characteristics of diaphragm EMG signals obtained with bipolar esophageal electrodes positioned near a region with low density of motor end-plates and aligned in the direction of diaphragm fibers. Left: Raw EMG and computed power spectrum from a pair of electrodes with a 10-mm interelec-trode distance. Right (top and bottom): Signals derived at the same time from the same region using electrodes with a 5-mm interelectrode distance. Right (middle): On the left is shown a cross-correlogram obtained from the successive cross-correlations at various time delays between EMG signals obtained with a 5-mm interelectrode distance; on the right is shown two motor unit action potentials (MUAPs) obtained from the two electrodes pairs with a 5-mm interelectrode distance. Reprinted by permission from Reference 46.
so that the relative distribution of power in the spectrum is altered and fc is reduced (1, 14-17, 40) (Figure 6). Figure 6. 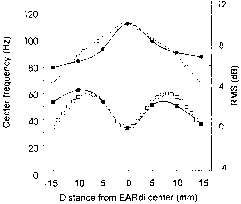 The influence of esophageal electrode positioning on diaphragm EMG center frequency (fc) (left axis; circles) and root mean square (RMS) (right axis; squares). Solid symbols indicate experimental data, whereas open symbols indicate computer-simulated power spectra. The "0" on the x axis indicates the center of the electrically active region (source). RMS was lowest at the electrode pair positioned directly over the source (due to the cancellation effect of a bipolar electrode). Caudal and cephalad to the source, RMS increased progressively to maxima at approximately 10 mm from the source in either direction. fc was maximal at the electrode pair directly over the source, hence less high frequency is filtered by the electrode being closer to the muscle. Reprinted by permission from Reference 46.
power, with relatively higher attenuation of low-frequency components. With bipolar recordings of EMG, electrode orientation with respect to fiber direction and interelectrode distance should be standardized, and investigators should recognize that these relationships are likely to change with muscle contraction. Signal disturbances. Electrode motion-induced artifacts. Movement of the electrode or a change in the pressure on the electrode results in a redistribution of the charges in the resistive-capacitive interface between the electrode and the tissues, causing relatively large amplitude artifacts with low frequency (mostly below 20-25 Hz) (39, 42). Most of the motion artifact can be filtered out with high-pass filters. However, some EMG power occurs at frequencies below 25 Hz, and even the most efficient filter attenuates some of the power above its cutoff frequency. Thus, high-pass filtration inevitably leads to loss of low-frequency power from the EMG signal. When power spectrum analysis is applied, the power related to electrode movement can be reduced (42) or replaced by an extrapolation of the diaphragm EMG power to those frequencies (39). Noise. Background noise, signals of unidentifiable origin, can be assumed to have constant power density over the frequency region of interest in EMG recordings. On the basis of this assumption, the noise component of the signal-to-noise ratio is usually estimated from power density values obtained in the uppermost frequency range of the EMG power spectrum (39, 43, 44). Noise originating from modern electrophysi-ologic instruments is not usually a problem, but ancillary equipment, such as pressure or motion sensors, pumps, or respirators, may introduce noise in various frequency ranges. Disturbances from power lines. Sinusoidal alternating currents (ACs) originating from power lines can usually be reduced to a negligible level by proper shielding of electrode cables and connections, by using amplifiers with high common mode rejection ratio, and by connecting all instruments to the same ground point. Residual power line disturbances can be filtered out with "notch filters," or, alternatively, the power of the affected frequency and its harmonics can be excluded in power spectral analysis. Potential artifactual influences of physiologic origin. Crosstalk signals. These are signals originating from muscles other than the muscle being investigated. The best-described source of cross-talk is electrical activity from the heart (EKG). Esophageal recordings of diaphragm EMG are particularly susceptible to cardiac cross-talk, which provides a signal with some 10 times the power of the diaphragm EMG but with a much lower fc (39, 42). For measurements of stimulation-elicited cMAPs, EKG artifacts are relatively easy to avoid by triggering the stimulus from the QRS complex with an appropriate delay. Alternatively, any record visibly superimposed on the QRS complex can simply be discarded. For time domain analyses over long periods of time or for power spectral analyses, EKG artifacts pose a significant problem. Heart rates often change, as, for example, with inspiration and with exercise. The frequency content of the EKG is lower than that of EMG activity, but there is considerable overlap (39, 43). Thus, if the high-pass filter is set high enough to eliminate most of the EKG activity, it will also eliminate much of the EMG activity. When EMG frequency content might be shifting toward lower frequencies, as during increasing muscle effort, excessive high-pass filtration will result in spurious reductions in measured RMS. Methods to eliminate the cardiac activity from esophageal recordings of diaphragm EMG by template subtraction (45) have been proposed. However, because the amplitude and shape of the electrocardiogram change with changes in lung volume, the safest method to avoid cardiac influences on diaphragm EMG signals still appears to be selection of signal segments that are free of cardiac activity (39). Another source of cross-talk in esophageal recordings of diaphragm EMG is esophageal peristalsis (39). The esoph-ageal peristalsis signals show a relatively large amplitude and relatively low-frequency content. In general, signal segments contaminated by esophageal peristalsis, usually easily identified as strong, slow esophageal pressure waves, should be excluded from analysis. other examples of cross-talk sources include contamination of diaphragm EMG data recorded from electrodes on the lower rib cage with abdominal or intercostal muscle activity and contamination of intercostal muscle EMGs by interference from pectorals, abdominals, or diaphragm (46). Innervation zones. Electrodes positioned close to or over an innervation zone (a region with a high density of motor end plates) produce complex interference patterns, because the action potentials elicited by firing of an individual motor unit may propagate in opposite directions relative to the electrodes (2, 47, 48). characteristically, there is reduced total power and increased high-frequency content (49). This effect is maximal when bipolar electrodes are oriented parallel to fiber direction; esophageal electrodes, which are arranged approximately perpendicular to fibers, are less susceptible (18). Inlluence of changes in muscle length or chest wall configuration. changes in chest wall configuration systematically affect the amplitude and frequency content of evoked cMAPs measured with chest surface or esophageal electrodes (13, 50). With spontaneous EMG activity, artifact-free signals recorded from esophageal electrodes are not systematically affected by changes in chest wall configuration (17, 18, 25, 50, 51). Because conduction velocity is not significantly affected by muscle length (52), most of the chest wall configuration effects on EMG are probably due to muscle-to-electrode distance or orientation changes. Inlluence of changes in muscle temperature. Muscle temperature increases during exercise, because of the increase in blood flow to the muscle (53, 54), and metabolic heat production (55). Because the propagation velocity of the muscle fiber action potential is correlated with temperature (56, 57), EMG frequency content must also be temperature dependent. No method for control of or correction for temperature in recordings of respiratory muscles has yet been described.